When I first began eating better and had what I call my “food conversion“, making healthier meals with better ingredients was its own challenge, but for me that was easier than figuring out an even bigger dilemma: what in the world to give the kids for healthy snacks. It seemed like everything was in the “bad” category now. If you have more to add to my list, please leave a comment below and share it with everyone! Notes: I'm adding three stars (***) by the ideas below that would be good low-carb options if you have weight issues you're concerned about. And you may want to read Is Edamame a Safe Snack? 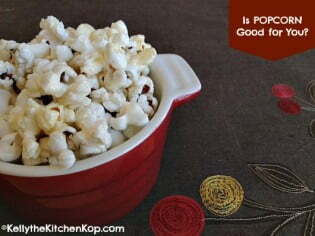 Kelly's Healthy Popcorn and Is Popcorn Really Good for You? ***Nitrite free salami – find a farm or meat market that sells all-natural meats: www.localharvest.org or www.eatwellguide.org. Or click here to get safe, healthy meat online. ***Cheese, preferably raw – read more here about the amazing benefits of raw dairy! 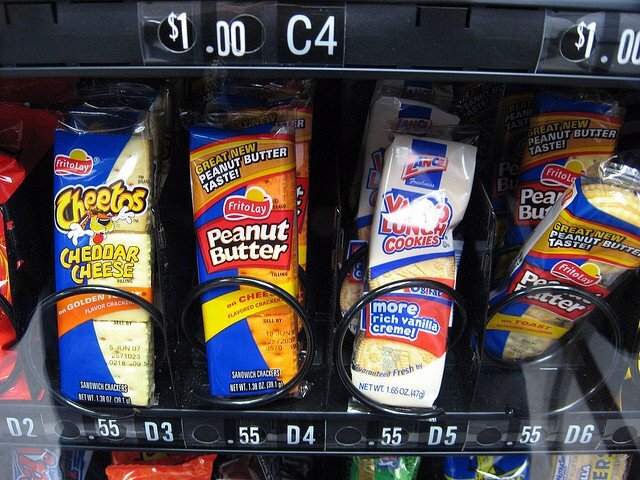 No “processed cheese” — Sick! Homemade cookies – preferably with less sugar than the recipe calls for, or at least with more natural sugars like organic cane sugar, honey, maple syrup, and the jury is still out on Agave Nectar – read more about that at the My Dark Secrets post. ***Crispy nuts – an extra healthy, yummy & easy way to prepare nuts. 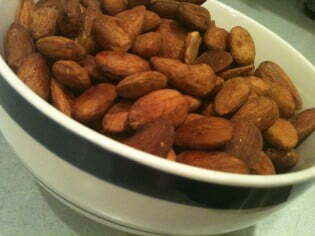 Or even better, try these chili lime almonds. Organic dried fruits (raisins, cranberries, etc. – these are great on salads, too) – these are least expensive through my buying club (check your local health food store), at a bulk foods store, or at an Amish store. Fresh fruits (preferably ) – Jeanne just gave me a great idea! 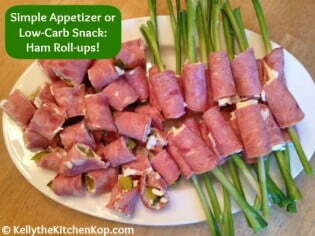 She will freeze grapes or berries in small baggies and the kids like to grab those for a quick snack on the go. Frozen fruits like blueberries, grapes, or mangos. ***With all fruits and veggies, keep an eye on the “Dirty Dozen“, so you know which ones it's important to buy organic (if they're a highly sprayed crop), OR which ones you can just buy conventional with no problem. ***Fresh veggies (again, keep an eye on the “Dirty Dozen“, so you know which ones it's important to buy organic (if they're a highly sprayed crop), OR which ones you can just buy conventional with no problem) – try dipping them in this easy-to-make homemade ranch. Organic applesauce – again, this is one of my “compromises” that I give the kids when I don't have any homemade applesauce in the freezer – I have a recipe which is SO good by the way, and from the Nourishing Traditions cookbook – it tastes like the best apple pie you've ever eaten: Homemade applesauce. Deviled eggs – yum! Or just plain hard-boiled eggs with sea salt. It's SO easy and FAST to make hard boiled eggs in the pressure cooker, see how here. Organic corn chips with this, the BEST homemade salsa recipe! or homemade guacamole – if you're not using homemade, check your labels and find some with short ingredient lists, no trans fats, no MSG, no preservatives, etc. (You'll have to do some sleuthing to find some half-way decent tortilla chips…) Also, my kids love this tasty Mexican layered dip. Here's the BEST homemade fresh salsa recipe! This is a weird snack that I LOVE to have for my lunch sometimes: a bowl of grapes or apples (preferably organic), crispy pecans and fresh shredded parmesan – yum! The kids love it, too. Sliced apples with cinnamon and a little sugar on top is always a hit. 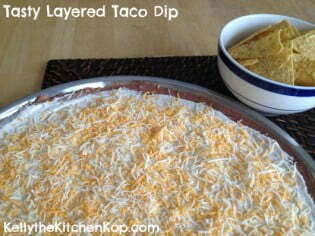 My kids love this “Texas Caviar”/Bean Salsa dip. Homemade pita bread crisps/bagel crisps/tortilla crisps – start with healthy versions of pita bread, tortillas or bagels (no trans fats, high fructose corn syrup, whole grain, preferably organic, etc. ), if using bagels, slice into thin pieces and brush with butter, and cinnamon sugar if desired, bake until golden. Easy. See my recipe for homemade tortillas! From Julie: “Honey Bunches of Oats”: use whatever amounts you prefer and mix together peanut butter, honey and dried oats, preferably properly prepared – made similar to Crispy Nuts: mix together 4 c. organic oats, 4 c. filtered water, 1/2 c. yogurt or whey – soak on the counter overnight. In the morning drain and spread onto a buttered cookie sheet. Bake at 150* (or your oven's lowest temp) for 24 hours or until crunchy. 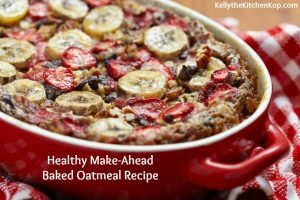 Leftovers of this wildly popular baked oatmeal recipe (even with those who aren't crazy about oatmeal), are also great for on-the-go. ***My kids love beef jerky or meat sticks. 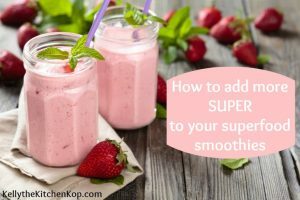 (Be sure to get the kind made without MSG – I usually get it at our farm, or you could try homemade. You can also click here to order healthy meats online.) Also, Braunsweiger or Head Cheese – yes, I said it, and I even eat it! The “head cheese” just tastes like sausage and it's so good for you! Thankfully, and surprisingly, our kids (all but our teen of course) love it. We always call it “sausage”, whatever you do, don't call it by the real names! Crab meat dip with crackers or celery. (Fresh crab meat is best because it's not easy finding canned crab meat without all the preservatives.) Mix one can crab meat with 8 oz. cream cheese and a few squirts of organic ketchup to your taste. Easy and kids love it. Homemade Potato Chips – guilt-free! Can anything good come from the chips aisle? Coconut for dieting and more! Sourdough Galore: English Muffins, Crackers, Pizza Crust, Pancakes, and Waffles! Just wanted to add in that I love fried plantains, which I’m sure are similar to fried bananas – and we dip them in fresh sour cream. YUM! I have made jerky using ground beef and it was good, even if it was a little surprisingly tough! We just had a 15 year old cow butchered and made the whole thing into hamburger. I think I will have to try the jerky again. Bummer! Oh well, it takes trial and error – I’ve had so many bombs in the kitchen, it’s sick. I’m open to suggestions about the right cuts to use, etc. Alisse, how did it come out? Try this website for beef jerky: https://monsterguide.net/how-to-make-beef-jerky Apparently, curing can be achieved with apple cider vinegar. I am about to test this theory (today). Read here about Splenda: https://kellythekitchenkop.com/2008/04/dangers-of-artificial-sweeteners-do.html. Try to avoid it if you can and instead eat small amounts of real sugars: https://kellythekitchenkop.com/2009/04/all-about-sugars-the-good-the-bad-the-disgusting.html. Hi! Wow your site is so overwhelming but very helpful at the same time! I just made my switch to whole milk today! It wasn’t too hard for me because I think it is delicious! Plus we already had some organic whole milk, because that’s what my one year old drinks. Anyway, I am trying to diet and I just was wondering if all low fat foods are not actually good for me. Like low fat crackers, pancake mix, pudding, yogurt, sugar-free jello, 100 Calorie Packs, etc? It’s just so crazy to me, all this stuff I grew up on thinking was ok for me actually isn’t? It’s a big transition! I was also wondering what you thought about Splenda and using that in baking like homemade cookies, breads, etc. Good question, I’d like to know that too. If you don’t hear from anyone here at my blog, let me know if you end up finding one somewhere else. Have you or any of your readers come across a good homemade beef jerky recipe that is MSG and nitrate/nitrite free? I’ve been searching the web, and most call for curing salts (which contain nitrates/nitrites.) Does any one have a healthy substitution for curing salts? I’m not sure if this is the right post to put this comment on or not, but I stumbled upon http://www.midwestfoodconnection.org while surfing the internet. This is a program in the Minneapolis/St. Paul, Minnesota, area whereby students are taught about nutrients in food, local sustainable farming and making good food choices. It sounds like an awesome program. Since I am just starting the journey of having children in school, does anything exist like this in our local school districts?